Spacious 4 bedroom, 2-storey Florida vacation home rentals by owners with private pool backing onto lake. Furnished to very high standard and just 5 miles from Disney World. Sleeps up to 10 people, cot available. From £450 per week. NOTE: 2 Florida Villas 1141 and 1142 are next door to each other and can be rented together as an 8 room booking - see rental property 1142 below for details. We have two privately owned 4 bedroom vacation homes, 5 miles from Disney. By staying in two homes you have a total of 8 bedrooms, AT A SPECIAL RATE FOR BOTH HOMES. They are extremely convenient for larger groups. 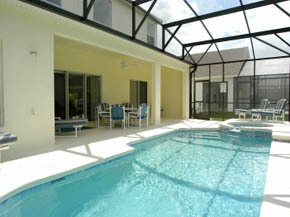 Florida Holiday Villas for rent From £800 per week for 2 Homes. 4 BEDROOM, 3.5 BATHROOMS TOWN HOUSE, FULLY AIR CONDITIONED, NEAR DISNEY. This property is situated at the fantastic resort of Regal Palms. The ground floor comprises of covered entrance porch, reception, kitchen, dining area, great room with cable TV, patio doors leading to covered terrace with open views. Double bedroom with large fitted wardrobe, TV and en-suite bathroom. Florida vacations From $95 per night. LAKESIDE DISNEY VILLA WITH OWN POOL, SPA, FISHING DECK AND PATIO. SLEEPS 14. Lakeside Villa on Luxury Estate. 6 Bedrooms. Beautiful Pinewood Lake at rear and pond to the front. Vaulted ceilings, large garden, lakeside fishing. Relax, fish or soak up the sunset! The perfect finish to a day at the parks, golf courses or beaches. Villa is 15 mins from DISNEY and is a perfect Orlando holiday location. From £518 per week. Villa Balmoral is situated in the private gated community of the Sanctuary situated 12 minutes from Disney World Florida and offers luxury executive style villa accommodation with 5 bedrooms and 4.5 bathrooms a large pool and jacuzzi and Sleeps up 8. Special offer only £500 a week until 2007! Two luxury villas next door to each other - a 4 bedroom, 3 bathroom villa, sleeping up to 10 people, and a 4 bedroom 2 bathroom villa sleeping 8 people. Both villas are on one level and boast a high level of luxury with excellent facilities, and are fully air conditioned throughout with private pool. From £400 per week. Located on Indian Ridge just 4 miles from DisneyWorld. 4 bedrooms, 2 bathrooms, family room and separate lounge and dining area. Fully equipped kitchen, plus all amenities along with DVD, VCR, stereo, and books and games. Kissimmee villas for rent From £450 per week. A luxury 4 bedroom, 3 bathroom Central Florida villa with private pool situated on Southern Dunes Golf and Country Club complex just 20 minutes from Walt Disney World. Sleeps up to 10 people. From £450 per week. Luxury 4 bedroom 3 bath villa, with south facing pool overlooking lake. The Villa sleeps up to eight people and is fully air-conditioned. 2 or 3 bedroom 2 bathroom executive villas, possibly the closest to Disney, just over 2 miles. One home adapted to be WHEELCHAIR FRIENDLY. Homes sleep 6-8. Our own privately owned villas. Florida Villas From £300 per week. PLUS - check with us now for late offer specials. Detached luxurious, fully air conditioned Davenport villa, sleeps 8 comfortably in 2 master bedrooms (both en-suite), 2 twin bedrooms. Child-alarmed patio doors onto the private pool deck and garden. Fully equipped kitchen and entertaiment facilities. Ameneties 5 mins, Disney 15 mins. From £350 per week. The two storey accommodation is ideal for two families sharing. TV/VCR and a games console. Fully fitted kitchen. Fully air conditioned, and wheelchair friendly. Disneyworld 11 miles away, restaurants, supermarkets, within 5 minutes drivey. From £495 per week. The house is air-conditioned, has 3 bedrooms and can sleep up to 8 people. Fully equipped kitchen. Patio doors have a child alarm fitted. Close to amenities, just 15 minutes from Disney. Florida vacation rental From £370 per week. A spacious villa of amenity and extravagance positioned in Westbury of Davenport, a mere ten minutes from Disneyworld and a short distance from an abundance of mainstream and quaint shops, golf and restaurants. With four bedrooms and three bathrooms.